Wow…this book…wow…I had no idea what was going on until the very end and then Michelle Hodkin threw a curveball that made you rethink the entire book! Mara Dyer wakes up in the hospital, not remembering how she got there. Three of her friends are dead, and she doesn’t know what happened. She doesn’t even know where it happened. She convinces her family to move to Miami in an effort to deal with PTSD. But as she starts at a new school, she starts seeing her dead friends in mirrors and hearing their laughs in the school courtyard. The only person there who doesn’t seem to think she’s crazy (which Mara is convinced she is) is Noah Shaw, British bad-boy with an ultra-bad reputation. As if things couldn’t get any weirder, Mara starts envisioning the deaths of people she hates: A man abusing his dog, her horrible Spanish teacher…and then the deaths happen. Just as she imagines them. 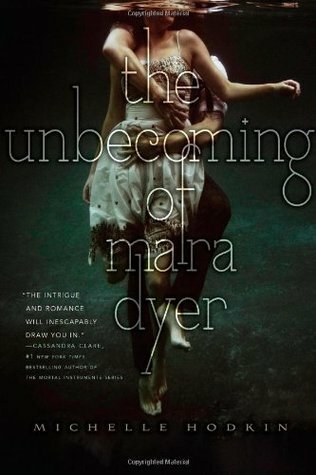 As Mara gets closer to Noah, she starts having dreams that help her remember what happened the night of the accident. But then she learns something about Noah that changes everything. First of all, GORGEOUS cover! I love it. “Seriously, you must have better things to do with your life than waste It on the hopeless?” “I’ve already learned Parseltongue. What else is there?” “Elvish.” (124). “I gracelessly darted into the crowd and only narrowly avoided being elbowed in the face by a girl attired in what could only be described as ‘slutty Gryffindor’ apparel.” (142). “I didn’t ask you to marry me. I asked you for dinner. What, are you afraid I’ll ruin the image you’re cultivating here?” “What image,” I said flatly. “Angsty, solitary, introspective emoteen, staring off into the distance as she sketches withered leaves falling from bare branches and…” Noah’s voice trailed off, but the look of cool amusement on his face didn’t. “No, that was lovely. Please continue.” (119). I loved Noah and Mara’s banter. They always had the most entertaining conversations. All in all, a really fabulous read.